I may live in the suburbs, doesn’t mean I’m blind to the plight of others. I’m a woman, doesn’t mean I blame my attitude on PMS. I’m beautiful, but it doesn’t mean that I am shallow, and just because I straighten my hair doesn’t mean I’m not proud to be Black. I’m intelligent, but that doesn’t mean that I think I know everything. I’ve made poor choices, but that doesn’t mean I am lost. I know which fork to use and when as well as where to place it when I am done, but that doesn’t make me bourgeois. I speak my mind, doesn’t mean I’m not open to other perspectives. I’m a romantic, but that doesn’t make me hopeless. I’m a Christian, but not damning others to hell. I love fashion, but not thriving off materialism. I appreciate my body, doesn’t mean I’m obsessed with my image. I’m liberated and liberal, but that doesn’t make me a freak. I love hip hop and tattoos, but that doesn’t take away from my refinement nor make me rebellious. I defy labels because they’re unnecessary in getting to the core of me. They won’t aid in the understanding of my behavior, my thoughts, or the woman I am. 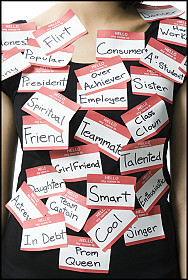 Labels limit me and I’m not one for impediments on my growth. I’m determined to prosper until my last breath and I’ll be damned if I let man put a finite cap on who I can become. I have gay friends and family whom I adore and not because they make great shopping buddies or love to gossip, that’s superficial. I adore them because they are great people and my love for them overcomes temptations of judgment. Our obsession with labels often interferes with our purpose in life which is to love others and be the manifestations of that love even when people are trying their damnedest to convince us of otherwise. Who a person chooses to love shouldn’t determine your ability to love them. What if someone chose to love you based on one dimension of yourself? Depending on the dimension they chose, you could stand the risk of being loved less, or worse, not loved at all. Embrace the challenge of casting aside preconceived ideas of a person based on a label and all assumptions pertaining to and choose to love them because they are people and everyone deserves respect and love. If you ever find the challenge hard, project yourself into their place.